Tired of the canned pork and beans where there is - literally - a tiny piece of pork swimming amongst the beans? Why not cook your own? It's loads better than the canned variety! 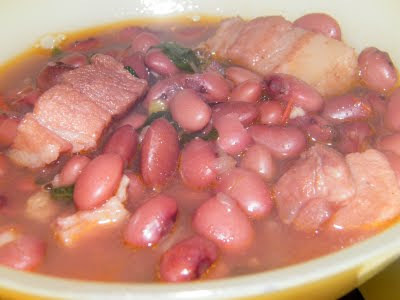 White kidney beans are normally used for this recipe, but this variety softens and breaks up rather easily when cooked. This is not bad at all, though. In fact, my older sister mashes some of the beans before serving it up, making a thick, yummy sauce out of it. But for variety you might want to try out the red or black kidney beans. These are better able to hold their shape, so you get to satisfyingly munch on the beans. In this recipe, we used red kidney beans. Bitter gourd (ampalaya) leaves are available from the Asian store, in frozen packets. Place kidney beans in a pot and pour water, the level of which is twice the height of the beans. Soak for about 4 hours. Let soak early in the morning, for example, then start cooking an hour before lunchtime. Boil then let simmer until beans are cooked (about 30-45 minutes or until tender). Set aside. Place pork pieces in frying pan and pour enough water to just barely submerge these and cook over medium heat, mixing occasionally. When the water has evaporated and the pork pieces start releasing its own oil, move it to one side of the pan, pour some cooking oil and saute the onion, garlic, and tomatoes. Mix in the pork pieces. When the pork is cooked, add the cooked kidney beans and water. Cover, return to the boil and let simmer for a couple of minutes. Add bitter gourd leaves and let it cook for a minute more. Season with salt and pepper.